When the snows blanket the game fields and the big game hunting seasons have long since passed, there is still an opportunity for the avid hunter to pursue those that hunt as well. I’m talking about getting out and trying to outfox, literally, critters like foxes, bobcats, coyotes and mountain lions. 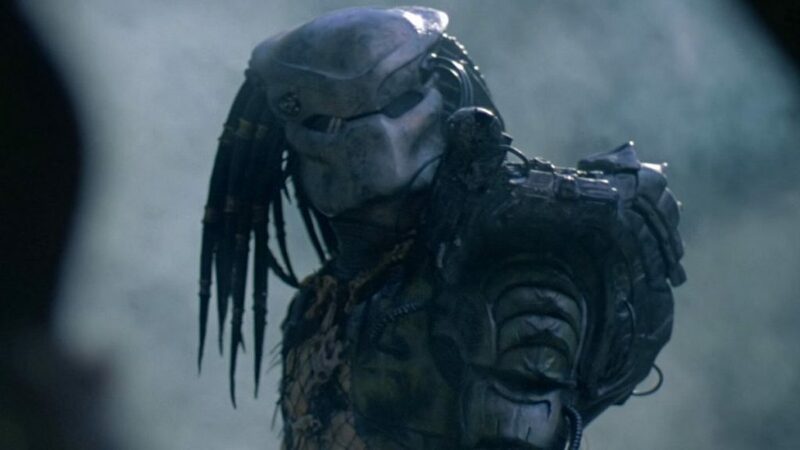 To succeed you must make the predator hunt you. In a few western states, hounds can be used to track and tree the cats as well as bears. But for many, winter predator hunting means lacing up the boots, putting on some miles and utilizing calls of some sort to entice the game of choice to hunt them and approach their stand. We’ll go over types of calls as well as our favorite calls for each type. Basically, two styles of calls are available to the sportsman today. Electronic calls and hand or mouth calls. Electronic calls usually consist of a digital player of some variety and speaker to broadcast the chosen sounds. Hand calls or mouth calls are generally those that are blown into or through to create the desired sounds. They consist of a reed that in some cases is pre-tuned and enclosed, a closed reed call. Or, an open reed call that can be tuned by changing your mouth position on the call or biting down on the call. Be sure to check your local game laws when it comes to electronic calls. Some states do not allow the use of electronic calls for hunting purposes. The real advantage to using electronic calls is that your hands are free to get your gun up and a take a shot or to run your video or still camera. You also get calls and sounds that are very consistent and you can control the volume depending on the area you are calling in and the animals you are trying to coax your way. 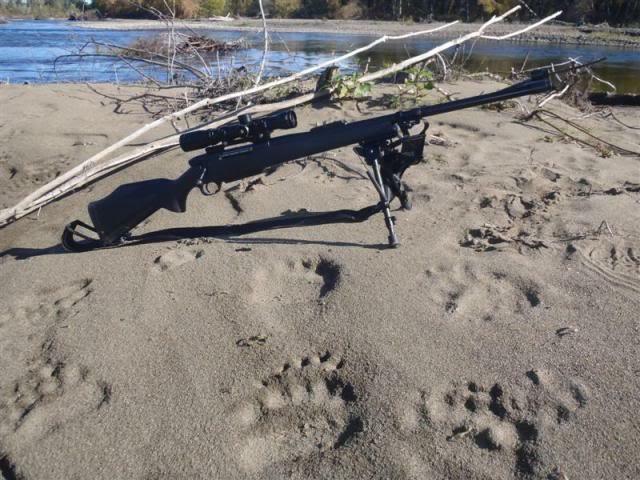 Weatherby Mark V near bear tracks. Downside to the electronic calls is the cost. You can find some models for less than $100 or you can spend in excess of $500. You also have to contend with battery life. 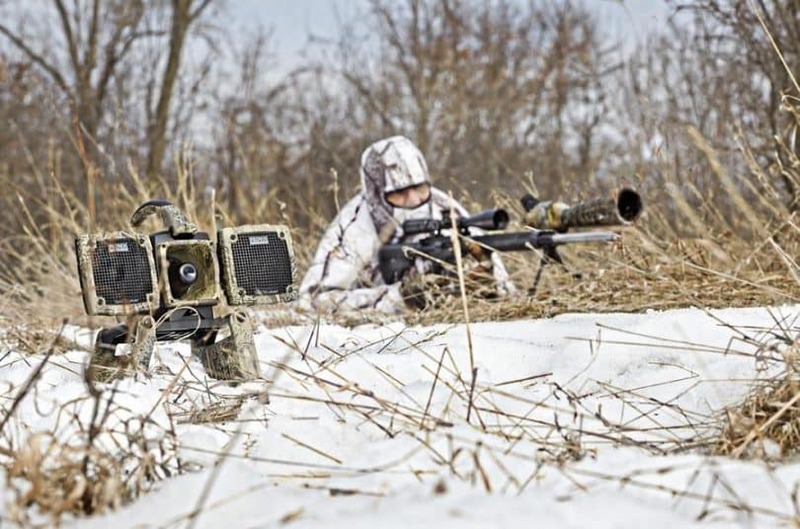 Remember, most predator hunting takes place in the winter, so you need to pack extra batteries with you. The calls can also be heavy and bulky. You have to consider this extra weight if you are a mobile hunter and putting on some miles hiking or snowshoeing. Finally, just like any skill, you need to practice with the programs and the remote to be sure you can call up just the right sound at a moment’s notice to get the coyote or cat to come into gun or camera range. This is a great call to introduce you to the world of electronic calling. It has a 300-yard range for the remote and is able to play two sounds at once to help fool the coyote that has been called to before. The call is programmed with the following 12 sounds: Cottontail Distress, Jack Rabbit Distress, Coyote Pup Distress, Fawn Distress, Woodpecker Distress, Crow Distress, Raccoon Pup Distress, Gray Fox Distress, Coyote Female, Coyote Male, Coyote Yip/Howl, and Bobcat Adult. The call also has a port for a decoy such as the Primos Sit and Spin and can be activated via the remote. The unit measures 8”x5”x4” and weighs two pounds. The call takes 4-AA batteries and the remote operates on 1-A23 battery. This call comes with 100 pre-programmed calls and can hold up to 200 different sounds. There is a USB port so you can program the caller from your computer. The sounds can be organized by category so you can quickly choose what you need in the field. In addition, there is a speaker jack so you can run an additional speaker on the unit. The remote is reported to work up to 500 yards away from the caller in wide open country. Best to test it and see how far away it will operate in the terrain you hunt. There is a port for linking up to a Foxpro decoy and it can be operated from the remote. Measuring 9”x6.5”x5” and weighs three pounds with batteries, the caller requires 10-AA batteries and the remote needs 3-AA batteries. When it comes to calls, Primos is a name hunters have trusted for years. The Alpha Dogg caller is packed with features to help get predators running right to you. With 75 sounds pre-programmed and the ability to program from a USB cable and store up to 1000 calls you should be able to find just what you need. The caller also has six pre-programmed Expert Hunts that are recordings of professional callers going through their set and calling for you! This caller has to fold up legs so you can elevate the unit a bit and also has a tripod mount if you want to get it up off the ground a little higher. The remote will operate at up to 200 yards away and will control a decoy as well. Unit measures 12.7”x11.7”x14.5” and weighs 3.63 pounds and requires 8-AA batteries for the base unit and 3-AA batteries for the remote. What’s your take on the Primos? The calls you blow to create your sounds have some real advantages. First, you can find calls for as little as $15, so you can get into the predator calling game with a smaller investment. Second, they are very portable. You can carry several calls in your pocket or a small pouch on your pack and not even know they are there. Third, no batteries or electronics to contend with in the cold. Just like a compass, they always work. The downsides to mouth calls are that you generally need to hold them in one hand to operate them. This means extra movement to get your hand on your gun or camera. It also takes a lot of practice to find the pitch and volume that works best and to be able to produce the perfect call every time. Finally, when it’s really cold the reeds can freeze up from the condensation of your breath. It generally is a wise idea to carry a couple of calls so if one does freeze you can warm it up in an inside pocket and continue calling with your back up. An accurate .223, a pocketful of calls and a snowy day can lead to coyotes in the crosshairs. This is a loud, high-pitched, raspy call designed to bring in predators from a long way off. The call is laminated wood and only weighs 1.6 ounces. This call is pre-tuned, but depending on the volume of air going it can produce several sounds to coax in wary predators. This call is designed to mimic the howl the coyote makes. For calling in coyotes from a long distance or locating far off dogs, this may be the call you need. Often the howlers will get coyotes to respond so you have a better idea where they are located or will start drawing them in so you can use your close-range calls bring the rest of the way to your camera or gun. The call is made of laminated hardwood. This call is perfect for calling in bobcats as it allows you to create a bobcat meow. You can also use the call for rabbit in distress and fawn in distress calls to call in coyotes or mountain lions. The call is made of soft rubber and the sounds generated depend on how hard you blow or bite down on the call. This little call would be very handy if you are in an area with cats as well as coyotes. This handy little call is one I have carried for many years. It really is a do-it-all tool that can stay in your hunting kit year around. With a little practice and by listening to the calls and instruction on the website you can create 17 different calls from antelope to turkey, including predator calls. 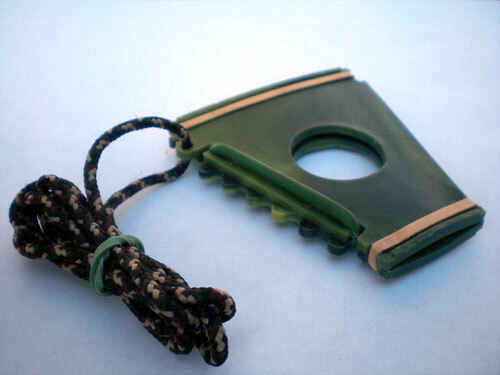 This a mouth blown call that is very durable and will last a lifetime of hunting. Don’t let your hunting season end just because the big game seasons are closed and snow is blanketing your favorite spots. Get yourself a couple of predator calls and hit the woods and see what happens. You don’t have to be an overnight expert. If you can make a sound like something in distress, chances are pretty good a hungry critter will come to check out what’s for dinner. I’ve had black bears come into a soft cow elk call thinking maybe a calf was separated from its mother. The coyote fur in the photos was one that came to a high-pitched, choppy elk bugle and got a little too close the business end of a muzzleloader. Predator hunting helps keep the hunters in check. Coyotes and bobcats do a number on game birds like pheasant, quail, and grouse. In a pack, coyotes kill a fair number of deer and elk each year. 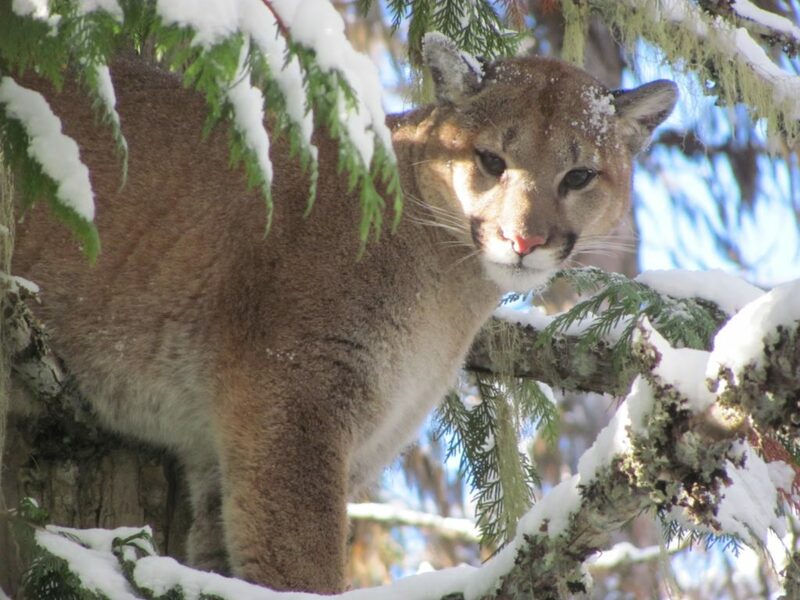 The bigger predators like mountain lions are virtual deer, elk and moose killing machines. Hunting these very efficient predators helps keep our game populations healthy and provides you the opportunity to hunt longer and hone your skills in the outdoors. Tell us about your predator hunting experiences and successes and what calls work best for you! 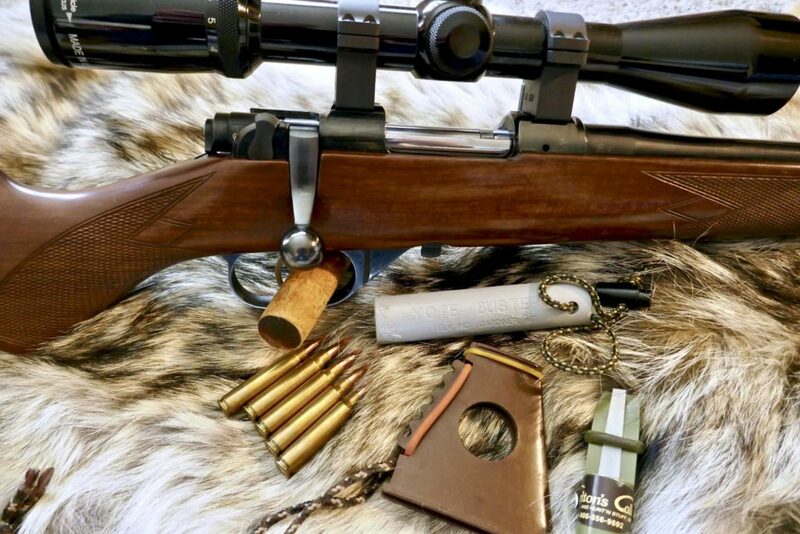 And don’t forget to take a look at our Best Ammo for Hunting guide!